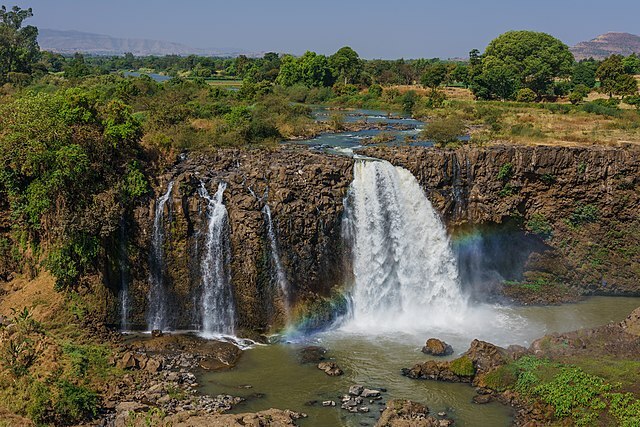 The Blue Nile Falls are located in the Ethiopian plateau, passing the Blue Nile River. It is one of the greatest falls in Africa. The Blue Nile River is a tributary of the Nile River which is the world’s longest river. It originates at Lake Tana. The waterfall is located on the upper course of the river. These falls are estimated to be between 37 and 45 meters high. It consists of four streams that can vary majorly in width depending on the season. During the dry season it can be a small trickle and more than 400 meters wide in the rainy season. Blue Nile Falls are also known as Tis Issat that means “smoking water” because the continuous dropping of water creates a smoke like bounce of water droplets. In 1770 AD, James Bruce came upon the Blue Nile Falls in his search for the source of the Nile. In order to divert the flow of water of the falls for electrical purposes, a hydroelectric station has been built here. During the rainy season, the waterfall can expand up to fifty times its normal size. With the heavy flow, most of the topsoil gets washed away and only infertile and bare soil is left behind. Blue Nile River is known as Abbay in the local language. This river contributes up to 80% of the Nile River’s flow. The falls are considered one of Ethiopia’s best known tourist attractions. The water volume of the waterfall fluctuates depending on the season. It gets high in rainy season and reduces significantly during the dry season. The Blue Nile Falls can be easily reached from Bahir Dar in northern Ethiopia.